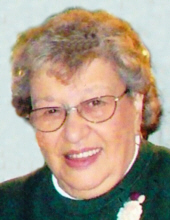 Mae (Philomena) Natlo, 90, passed away at Hartford Hospital on February 8, 2019. Born in Tarrytown, NY on July 16, 1928, she was the daughter of the late Gennaro and Dolorata Licursi Cerce. Mae grew up in North Tarrytown and graduated from North Tarrytown High School, class of ’46. She moved to Meriden in 1960 and had lived there since. Mae will be remembered by four sons and their wives, Patrick & Elaine, Jerry & Lisa, Paul & Mary, Mark & Khong; eight grandchildren, Kerry (Ira) Schwartz, Amber (Todd) Snyder, Amanda (Derek) Ciampini, Leanne (Zachary) Inzero, Nicholas (Kristen), Richard (Kristen), Jared (Sonia), and James; step-grandsons, Joshua and Sunray; ten great-grandchildren, Schuyler, Giuliana, Gabriella, Nicholas, Lucas, Giovanni, Luca, Bianca, Alessandra, Alessia, and Adriana; extended step-grandchildren, Chit, Chay, and Scott Khongdy and their families; niece, Marianne (John) Vitale; and nephew, Louis Cerce, Jr., all of NY. She was predeceased by a brother, Louis Cerce, sister-in-law, Antoinette Cerce, and a great-grandson, Jordan Snyder. Friends are invited to visit with her family at BEECHER & BENNETT-FLATOW FUNERAL HOME, 48 Cook Ave., Meriden, on Wednesday, February 13th from 5:00 to 7:00 p.m. A Funeral Service celebrating her life will be held on Thursday morning at 10:00 a.m. in the funeral home, followed by burial in Sacred Heart Cemetery. Contributions in Mae’s memory may be sent to St. Jude’s Children’s Research Hospital, 501 St. Jude Place, Memphis, TN 38105, www.st.jude.org. To send flowers or a remembrance gift to the family of Mae Natlo, please visit our Tribute Store. "Email Address" would like to share the life celebration of Mae Natlo. Click on the "link" to go to share a favorite memory or leave a condolence message for the family.